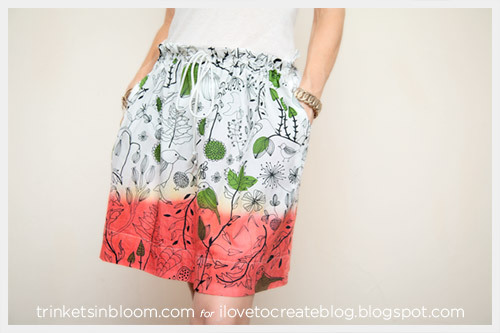 Create a cute and breezy Dip Dye Skirt for summer with inexpensive fabric and Tulip’s Liquid Dye. 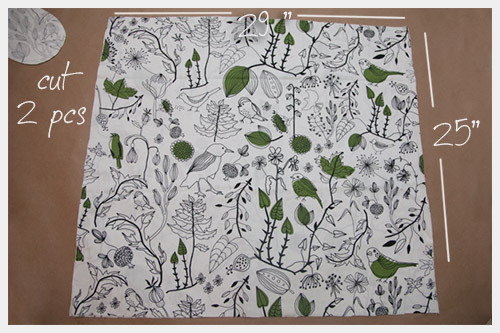 I love using unexpected materials for projects (this fabric is actually for home furnishings), but the print was so cute all I could think of was making something to wear out of it. This is the first time I’ve tried Tulip’s Liquid Dye and I think I’m a convert! This stuff is amazing! The best part is how quickly you get a great strong color and there’s very little to rinse out! It’s so easy to use, you’re going to love it too! Lay your fabric out, folded in half, on a flat surface. I wanted my skirt to be 18 inches long. I added 3 inches for the top waistband and 4 inches for the bottom hem. I cut my fabric 25 inches long, by the width of the fabric, which was about 52 inches after cutting off the selvedge. 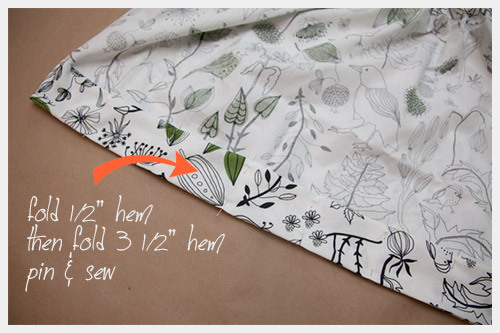 Make sure your fabric is folded in half and you cut 2. 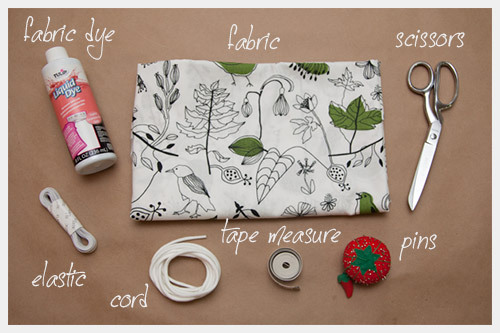 With your extra fabric lay it out on a table and fold it so you have 4 layers. 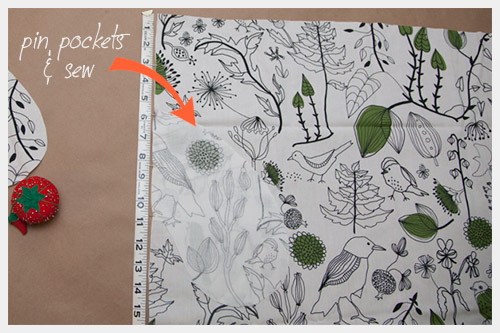 Lay your hand on the fabric and trace around it leaving extra room. Lay one pocket on top of each side of your skirt with right sides facing. Measure down from the top leaving room for the waistband and pin your pockets to your skirt. 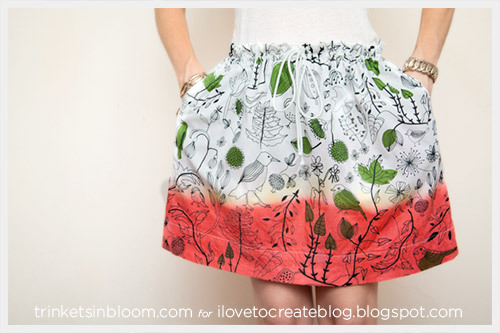 Sew the pockets to the skirt. When all your pockets are sewn to your skirt front and back, lay the two sides of your skirt together with right sides facing each other. Pin your side seams on both sides including the pockets. Sew your side seams together. With your skirt still inside out, fold the top of your skirt over a half inch and pin. Then fold it over another 2.5 inches and pin all the way around the top of your skirt. Sew right along the edge of this top fold. Next you will be sewing 2 seams in your waistband. 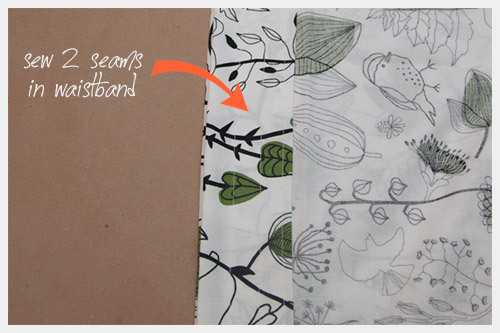 The first seam should be about ⅞” from the top fold on your waistband. 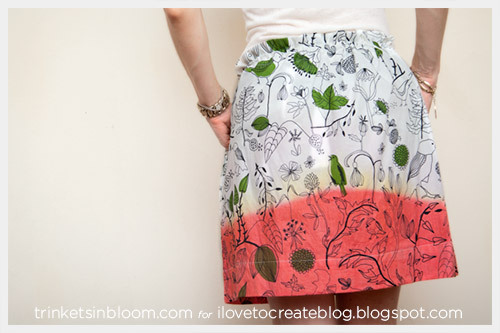 Sew all the way around your skirt. 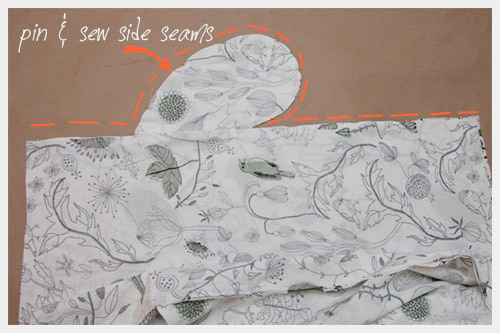 The second seam should be about ⅞” down from the first seam, all the way around your skirt. 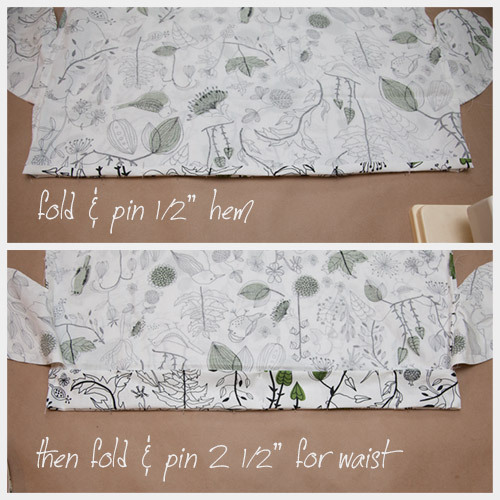 Lay it flat on the table and measure to the center of your skirt at the waistband. Cut a small hole on the front of your skirt. Attach your safety pin to one end of your elastic and feed it through the hole and all the way around your skirt. When you are finished, put your two ends together and sew them securely. Thread your cord through the same hole using the safety pin, the same way you did for the elastic. 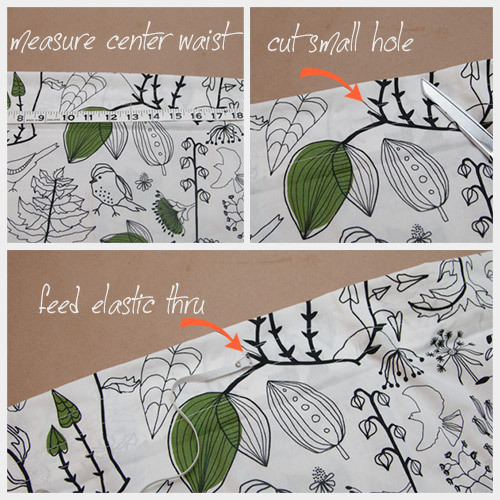 Turn your skirt inside out and measure for your hem. 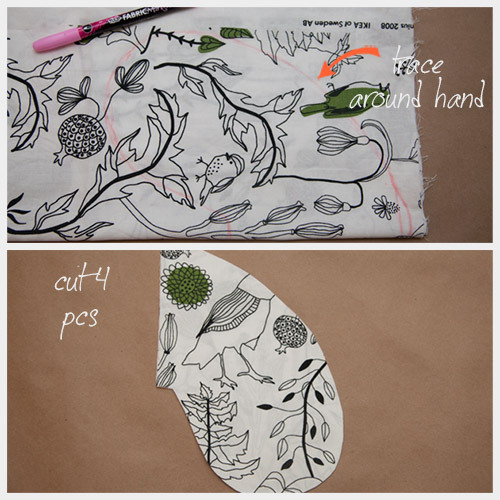 Turn the bottom edge over a half inch and pin, then turn the hem 3.5 inches, pin and sew. Turn your skirt right side out and hang. Mix up your dye according to the instructions. I used a sink, I filled it with hot water and added about ½ the bottle of dye. Then I added 1 cup of salt. 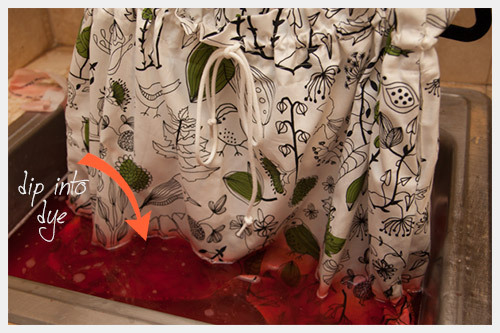 Mixed and hung my skirt over the sink with the bottom 5 - 6 inches in the dye. I let it sit for about 30 minutes and rinsed. Follow the instructions for washing and drying. Enjoy your skirt! Leave a comment and let us know how yours turns out! 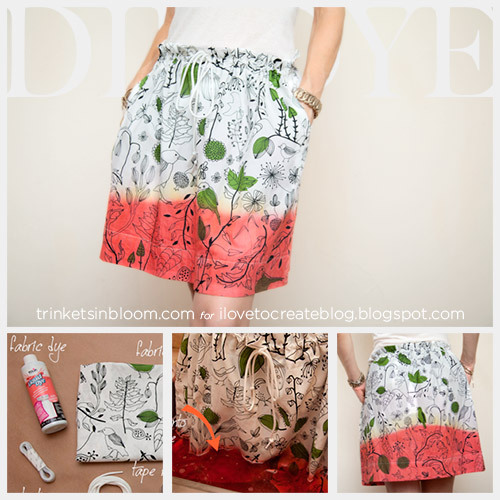 For more fashion DIY projects be sure to check out my blog Trinkets in Bloom!